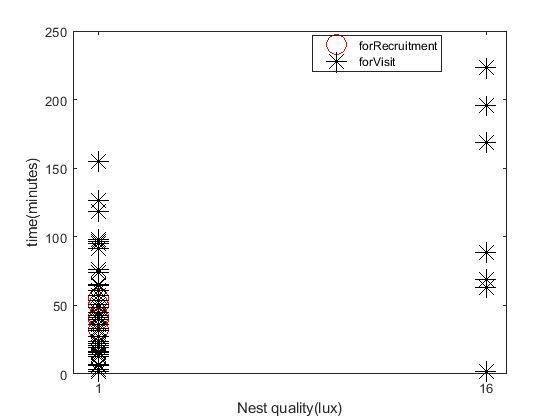 Hi, I am trying to make a scatter plot with multiple groups 'forVisit' and ''. What if i want to highlight each 'X' and '0' based on the elements in first column of 'read_time_series_data'? Any help to solve this will be appreciated. What does "highlight" mean to you? I can see both black asterisks and red circles in your data so it seems to be doing it correctly. If you want, you can use plot to overlay the circles with a thicker line width by setting the 'LineWidth' property to 2 or 3. What i meant is, each 'X' and '0' corresponds to a specific value in the first column which is unique. What i want to do is to highlight this value. Again, What does "highlight" mean to you? You cannot have the groups be unique unless every marker is in its own group. If that's what you want, use scatter() instead of gscatter() and you can probably make each marker unique (at least its color unique). Currently all the values corresponding 'forVisit' is represented by 'X'. But each 'X' corresponds to different value in the first column. So rather than a 'X', i want multiple colur marks to specifically represent each one.